The late start of Ethiopia's wet season and the unreliability of the rains could affect crop production this year and increase the number of those in need of aid, officials said. "The rainy season will start late particularly in the northeastern part of our country," Prime Minister Meles Zenawi told reporters at his office on 24 June. "That means the cropping season for some types of crops may not be appropriate this year." Ethiopia produces 90-95 percent of its total cereal output during the main rainy season, called 'meher', which runs from June to October. According to the US Famine Early Warning Systems Network (Fews Net), the `meher’ crop season is likely to experience below normal rains. The `belg’ (early rains, February-June) season, which normally accounts for 5-10 percent of total cereal output, has also been unpredictable. "Forecasts for rainfall during the main cropping season and in northern pastoral areas are below normal, particularly in areas of the east where production was poor this year, raising concerns that a serious food crisis could emerge in Ethiopia over the next year," Fews Net said in a 24 June statement. The late start of the early rains meant that only 50-70 percent of land planned for planting was sown by mid-April, according to the World Food Programme (WFP). Fews Net said the lowland pastoral and marginal production areas in the eastern regions had also received "below normal" rains. Meles denied the country was facing a food crisis. 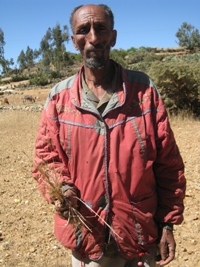 "We have hundreds of thousands of tons of wheat in our store houses here in Ethiopia." However, according to aid workers, Ethiopia has almost five million people requiring emergency food assistance. A total of 7.5 million chronically food insecure people also receive assistance through a social welfare scheme called the Productive Safety Nets Programme. To meet immediate needs, the Stakeholder Food Prioritization Committee has asked the government to release 11,000 tons of cereals. According to the UN Office for the Coordination of Humanitarian Affairs (OCHA), the government’s Disaster Risk Management Food Security Sector and WFP also have 30,000 tons of food in the pipeline. "However, this quantity covers only one third of the monthly requirement," OCHA said, adding that the food in the pipeline was likely to be available only in late July or August due to congestion at Djibouti port. "We have given priority to the transportation of fertilizers because we need fertilizers now," Meles said. "But we have spare strategic reserve food in our stores. So it does not make sense to prioritize transport of food from the port at the expense of fertilizers. If [WFP] is facing any problem in terms of transport... go to these [strategic reserve] warehouses and take out loans to be replenished later when their food in the port is transported to the country."